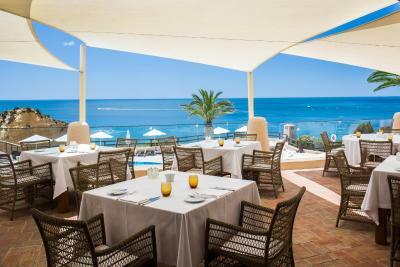 Lock in a great price for Vilalara Thalassa Resort – rated 9.4 by recent guests! Breakfast was fantastic with amazing views to start your day. Gardens are well-kept and staff goes out of their way to help. 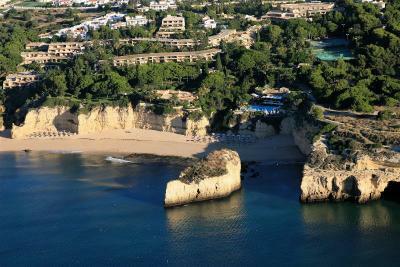 The resort is also located along a beautiful cliff walk (Seven Hanging Valleys Trail) that from which you can access many beautiful beaches and the views are incredible - definitely worth leaving the resort to check it out! Everything. Beach that the hotel has access to is gorgeous and quiet. Short drive to cave tours. Breakfast is amazing. The room is very cute, I can nap all day on the daybed on the balcony. Spa is very nice and offers a lot of services. Staff is incredible - the effort they put in to make your stay pleasant was unbelievable. Everywhere on the resort smells so nice, it was like a botanical garden, oh and there are swans and other birds, and a falconer that scares away seagulls. Everything was beautiful! Most amazing staff and manager loved loved loved it!!!! Beautiful property on the coast with private beach area! Comfortable rooms! Excellent, professional service and staff! My wife became very sick while we were there and the staff was incredibly hospitable and provided incredibly compassionate service to make her feel more comfortable. Very kind staff and beautiful place for a holiday! Amazing staff, suite and beach location! We loved it here! The breakfast was great. The views were amazing. The rooms were comfortable. Loved this place. 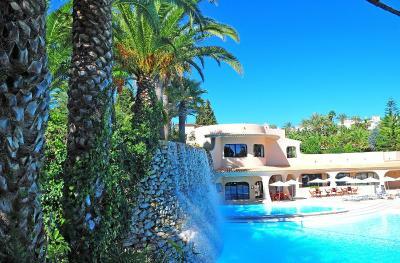 Private location with beautiful views and nearly private beach. Pools are also nice. Staff is friendly and helpful. IMPRESSIVE !!! This is the best resort I ever stayed at. Every single detail was taken care of. The location, the infrastructure, the staff... everything is perfect. Definitively two thumbs up! 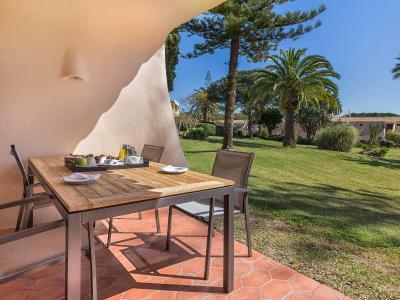 Vilalara Thalassa Resort This rating is a reflection of how the property compares to the industry standard when it comes to price, facilities and services available. It's based on a self-evaluation by the property. Use this rating to help choose your stay! 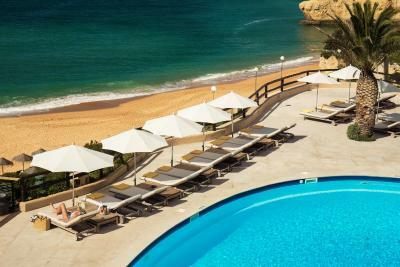 One of our top picks in Armação de Pêra.Located on cliffs overlooking Praia das Gaivotas and the Atlantic Ocean, Vilalara Thalassa Resort features a luxurious spa, 6 outdoor pools and 2 restaurants. 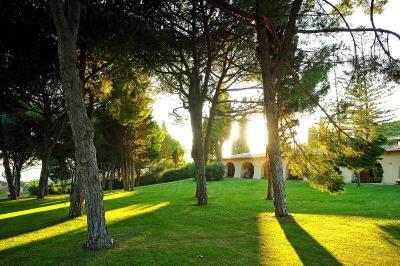 Spacious suites are surrounded by extensive landscaped gardens, 3 tennis courts and 1 padel court. 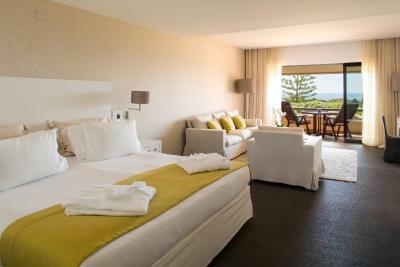 The air-conditioned guest rooms have private balconies overlooking the gardens, the sea or the pool. 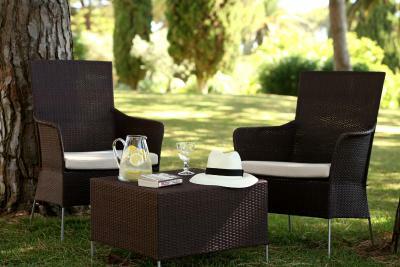 Free WiFi, satellite TV and a large seating area are offered in all rooms. 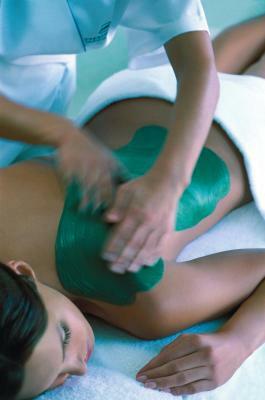 Guests can enjoy thalassotherapy treatments and hot stone massages at the spa. A sauna and a Turkish bath are featured. 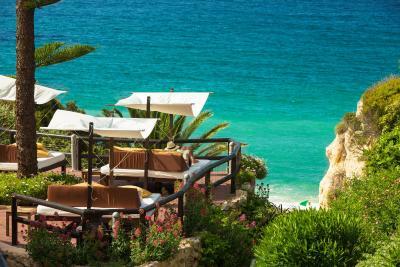 Vilalara Thalassa offers a fitness center and yoga classes. 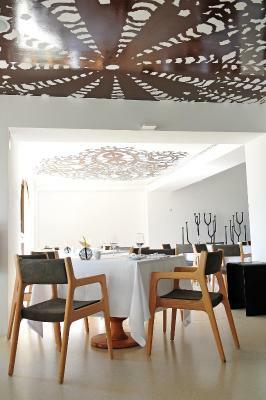 The B&G Restaurant is a low-calorie restaurant offering gourmet Portuguese cuisine and a buffet breakfast. 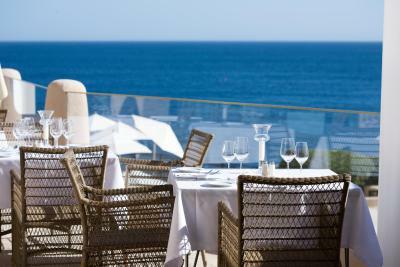 The Terrace Grill is a seasonal restaurant providing seafood and summer barbecues. 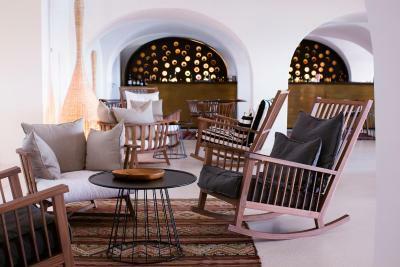 Tonic Lounge Bar has sea views from its poolside location. 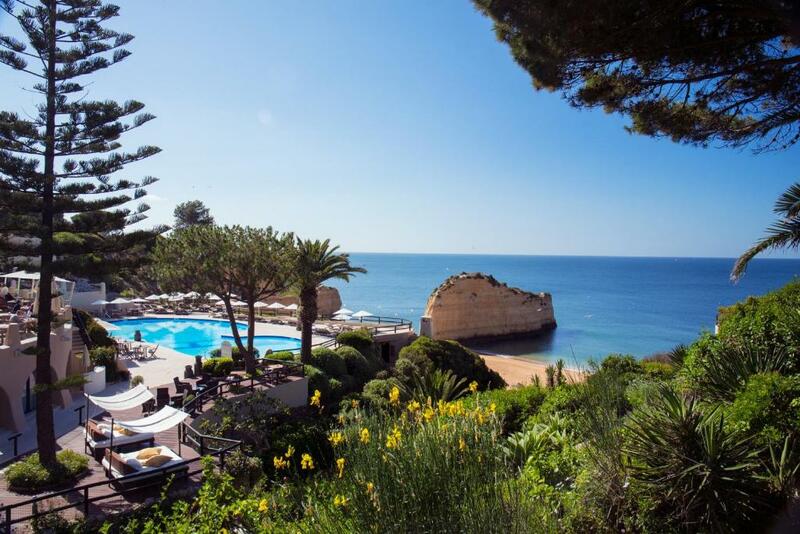 Vilalara Thalassa Resort has direct access to the Praia das Gaivotas beach and a car and bicycle rental service is provided by the resort. 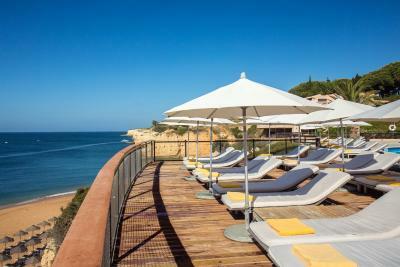 Aeroporto Internacional de Faro is 35 mi away and free private parking is available on site. 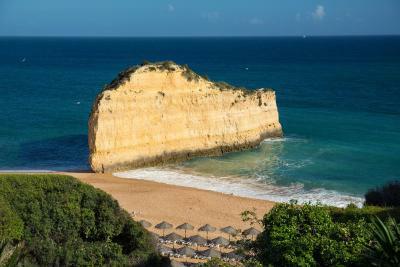 This property also has one of the top-rated locations in Armação de Pêra! Guests are happier about it compared to other properties in the area. 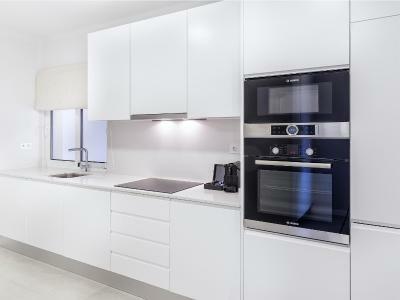 This property is also rated for the best value in Armação de Pêra! Guests are getting more for their money when compared to other properties in this city. 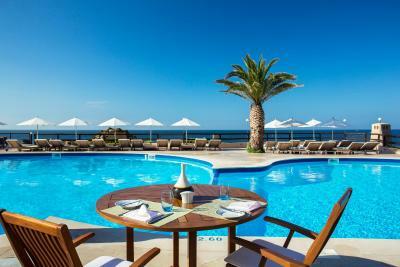 When would you like to stay at Vilalara Thalassa Resort? 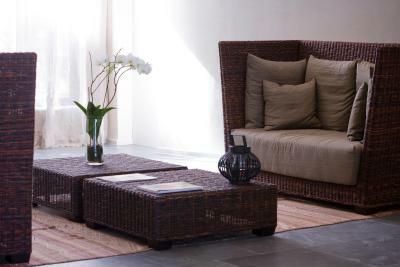 This spacious suite offers a separate living room with sofa and wooden table. 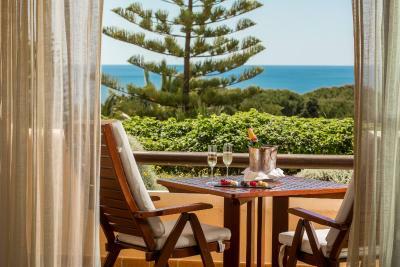 Elegantly decorated in natural tones, there are views of the resort's gardens from a private balcony. Room amenities include free WiFi, a complimentary bottle of water per day, a Nespresso machine with 2 complimentary coffee capsules per day and tea making facilities with 4 complimentary tea bags per day. This Suite has the maximum occupancy of 2 adults and 1 child up to 12 years or a 3rd adult in extra bed. This spacious suite has a separate living room with sofa and wood table. 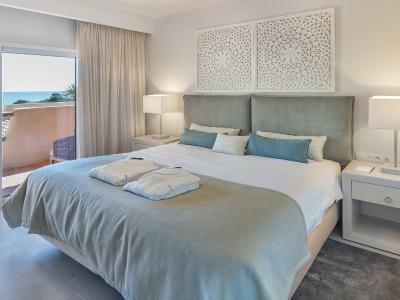 Elegantly decorated in natural tones, there are views overlooking the swimming pools from a private balcony. This Suite features a spacious living room and an innovative architectural bathroom concept, with shower or bathtub integrated in the room. 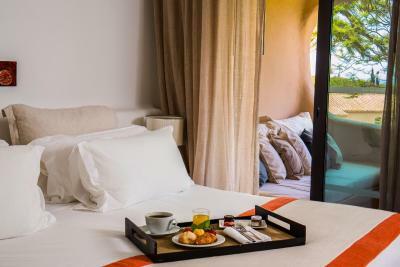 Also included is a comfortable day bed in a large balcony offering panoramic views of the resort's gardens. It has the maximum occupancy of 2 adults and 1 child up to 12 years or a 3rd adult in extra bed. 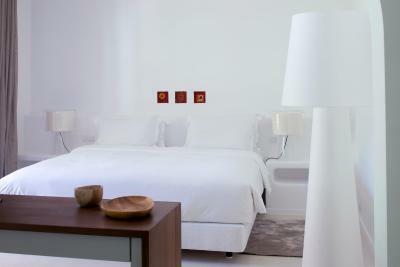 Elegant room featuring one or two spacious and comfortable beds, decorated in modern and comfortable style. 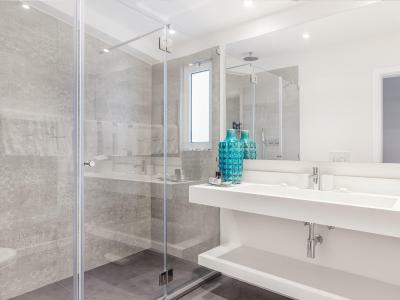 The bathroom includes a separate shower and a bath with an independent toilet area. 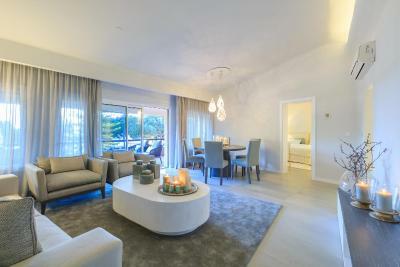 The living room is an extension of the bedroom with wonderful sea view. 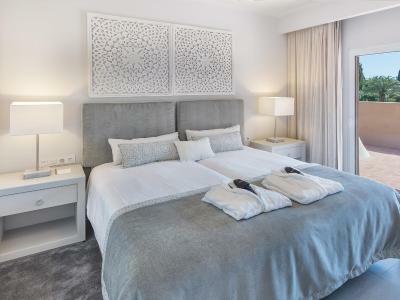 This luxurious suite has 377 ft², which include a terrace area offering a lounger and panoramic views of the resort's gardens. It has a spacious bedroom, living room and two bathrooms. 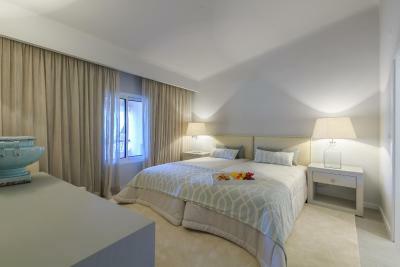 For guest's convenience, the bedroom and living room can be separated into two independent areas. This Suite has the maximum occupancy of 2 adults and 2 children up to 12 years of age or a 3rd adult in extra bed. 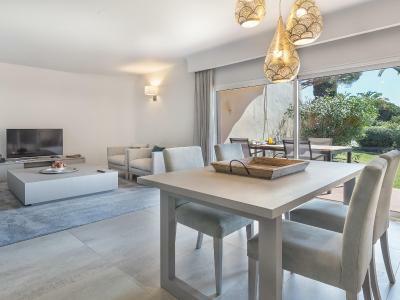 This ample and luxurious apartment offers a total area of 610 ft², with three spacious bedrooms, two with private bathrooms. There is also a guest bathroom, an independent living room with dining area and a separate kitchen. The apartment has a large balcony with garden views, seating area and a dining table. This apartment has a maximum occupancy of 6 people plus 2 children up to 12 years or plus 1 adult in an extra bed. Suite with 459 ft² featuring a spacious bedroom, a living room and a dining room. The Premium Suite features a bathroom with hot tub and shower as well as a separate toilet area. 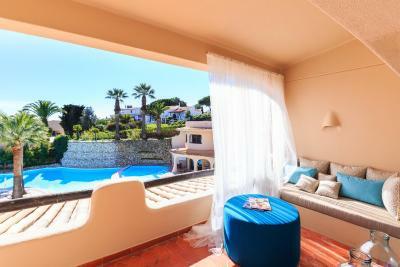 The balcony is spacious and offers views over the resort's gardens and pools. Maximum occupancy: 2 adults + 2 children up to 12 years of age or 3rd adult in an extra bed. 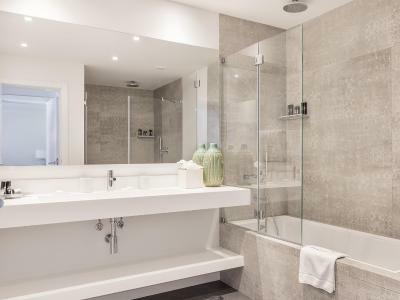 This wonderful apartment offers a total area of 476 ft² with two spacious bedrooms, one with private bathroom. There is also a guest bathroom, an independent living room with dining area and separate kitchen. It also has a large balcony with resort views, seating area and a dining table. This apartment has a maximum occupancy of 4 people plus 2 children up to 12 years or plus 1 adult in an extra bed. Innovative and inspired by nature and the senses, Blue&Green offers unique hideaways and excellent service paying great attention to detail, because that’s where we excel. A concept that stands for excellence, exclusivity and creativity. 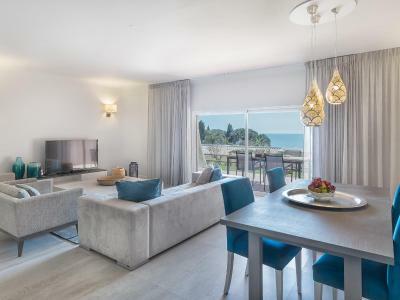 House Rules Vilalara Thalassa Resort takes special requests – add in the next step! 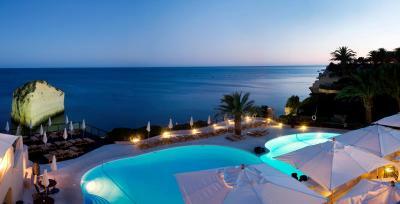 Vilalara Thalassa Resort accepts these cards and reserves the right to temporarily hold an amount prior to arrival. Please note that guests who do not stay the full length of their reservation after check-in will be charged the total amount of the reservation. Please note that for bookings that include more than 1 child, guests must inform the property in advance. The reservation is then subject to confirmation, due to the capacity of each accommodations type. Please note that check-in for apartments is from 16.00. Please note that all guests must present the credit card used to secure the reservation during check-in. Confirmation of ownership will be made upon presentation of an official identification document. If you are not the owner or intend to pay at the hotel with a credit card different from the one used to guarantee the reservation, the hotel will refund any amount already charged on the card used for guarantee. Full payment of the reservation will be made in person using the new credit card provided. Location and service at Vila lara was nothing short of excellent! We travelled with a five month old baby and found a cot, baby bath and shampoo free of charge and without us booking it in advance. The rooms are beautiful and clean. 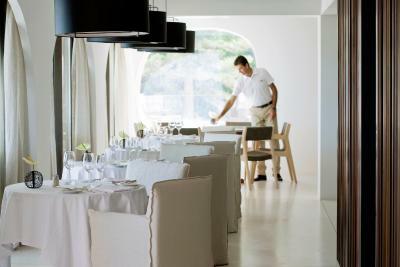 All staff - from reception, to waiters, to cleaners are exceptionally friendly. Breakfast was delicious and the two restaurants brilliant. Pools and beach stunning! Couldn’t have asked for more, we had the best time there and will be back. Very helpful staff. Relaxed atmosphere. Our stay was just a perfection. We chose the hotel on The Telegraph ( UK ) recommendations and had one of the best family holidays. 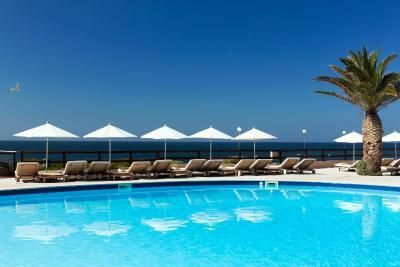 Arrived in quieter month of March, we still enjoyed warm weather and the heated pool and the beach. 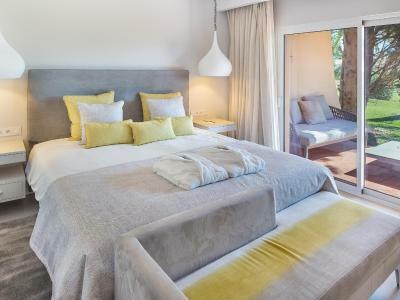 Our family suite was superb, very spacious, with two balconies overlooking lush green gardens. Soft large beds with TV, in a quieter part of the hotel. We stayed for 6 nights and felt truly relaxed in no matter of time. Our 3 years old really enjoyed jumping in sand dunes and running on a beach. Water was still a bit too cold as it was March. He also loved the newly restored kids playground with a huge wendy house and great indoor play area. We also went for a cliff walk to a near by village - 40min walk, our 3 years old managed too. Incredible views! Nice to do short afternoon trips to see the surrounding. Unfortunately we didn't manage any longer day trips to nearby beautiful beaches. Plenty to see there! The hotel staff are just incredibly welcoming, warm yet professional. Amazing morning breakfast buffet. We definitely want to come back, in season, to experience all the hotel has to offer - like b&q and night entertainment. We also didn't try any wanter sports as there were big waves during our stay. But it's still perfect and warm enough for early spring break. Thank you Vilalara Thalassa for amazing holiday! I would have liked to stay for longer!! 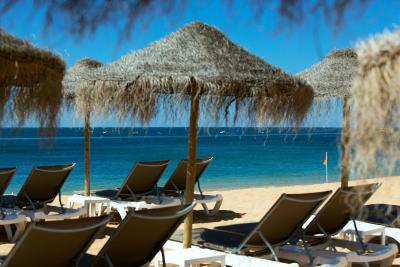 It is an oasis of tranquility on a beautiful secluded beach. The grounds are stunning and very peaceful. The room was amazing, spacious, comfortable and quiet. The staff, especially the reception staff were fantastic. Amazing spa. The pools were lovely. The kids club also looked great, although I was traveling solo on this occasion 😊 Wonderful breakfast too! Wonderfull location! Very attentive service. Very nice playgound for the kids! The little playhouse is just fabulous! Our daughter loved it! Great views from the restaurant! Very good breakfast! 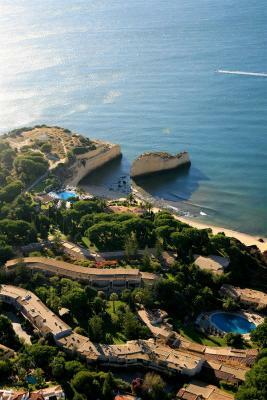 Extraordinary resort! Great location and very nice staff. 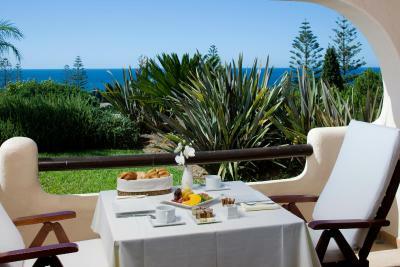 Breakfast is delicious and is served in a balcony with an amazing view! The staff were so friendly and helpful. The decor was subtle and luxurious. 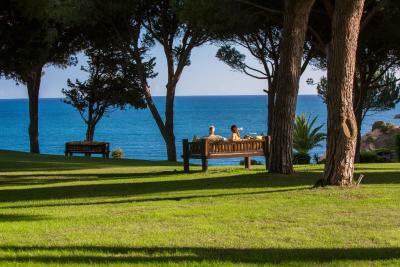 The resort is a real oasis, we woke to the distant sound of waves and birdsong. The gardens are beautifully maintained. We are looking forward to a return visit! So beautiful loved everything about it! Interior was amazing what a awesome spot!!! The staff were so helpful and very welcoming. In particularly Ines and Andre.